This is absolutely gorgeous. Its one of my favourites by you, I think. I love the writing too. You have fabulous gorgeous beautiful writing. You've captured the essense of why I sketch ~ it lets me relax, focus, stay in balance. 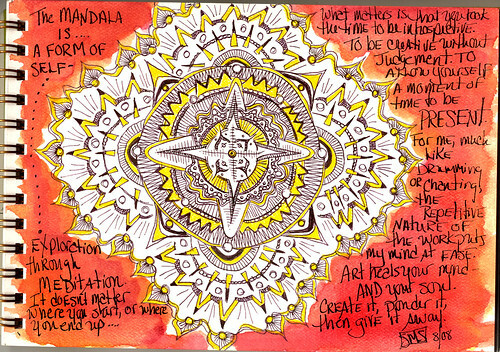 I love the mandalas that you bring to life with paint. Also... I've not drawn with a fountain pen - lately I'm using micron 01-05 or PITT pen SF but you have motivated me to try! I've always expected them to leave ink drops! Kata, you are too kind. Gypsy - Fountain pens, where the ink is contained in the body of the pen or in a cartridge, shouldn't ever produce ink drops. They (usually) have a very nice smooth even flow. If you shake the pen or drop it, you could get a few spatters.